Taking a break from HG Reviews to continue with the "cleansing conditioners": HairVeda Amala Cream Rinse. Product Claims: Amala Cream Rinse is a Creamy Hair & Body shampoo which lightly removes dirt & oils. ACR is formulated with all natural lemon & orange oils and specifically designed to clean tresses. ACR is also great for those with sensitive skin types. Give your hair and body a light cleanse with our unique formula. Ingredients: Aqua (Water), Cetearyl Alcohol, PEG-40 Castor Oil, Stearalkonium Chloride, Citrus Medica Limonum Argentina (Lemon) Peel Oil, Orange Peel Oil, Germall Plus. Fragrance. Thoughts: It's a nice conditioner, but a cleanser it is not. It's very light and runny similar to the consistency of a V05 conditioner (my bottle is empty so no pictures). It doesn't wow in terms of moisture, but it isn't drying either. It's something I would use if my hair is not in need of too much cleansing and is already detangled and sectioned--just when I want something more than water, but not too heavy. It's literally a "cream rinse". The fragrance is a light citrus. HairVeda's customer service is ok; not the best, but certainly not the worst. They could be more communicative in informing customers of their order statuses. The time between ordering and receiving the product can be anywhere between 2-4 weeks in my experience. I haven't ordered from them in almost a year so hopefully there has been some improvement. 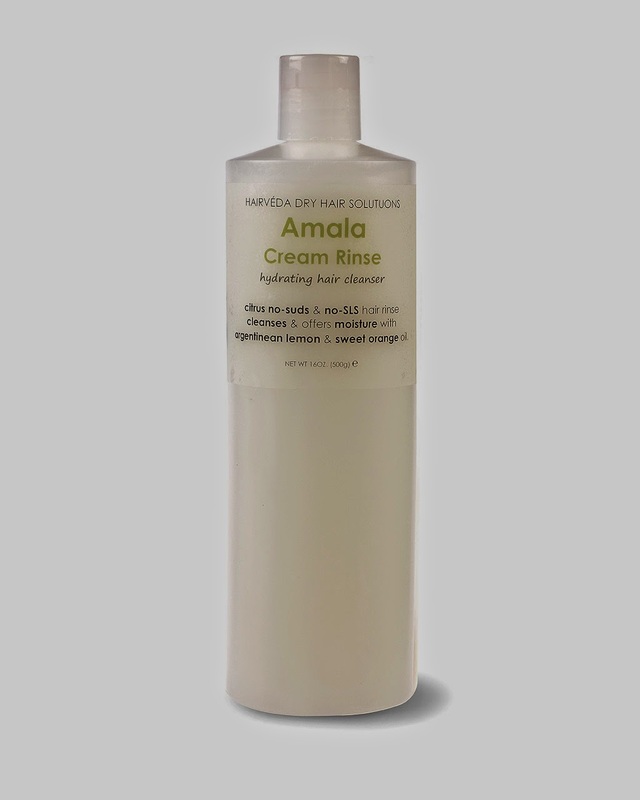 HairVeda Amala Cream Rinse is available for $11.99 (16oz) on their official site. It can also be purchased from select web-based and local stores. For locations click here.